One of my favorite things about the warmer temps is that I get to lace up my shoes, grab my dog and hit the trails. I am not a runner and can think of pretty much anything I’d rather be doing than running. 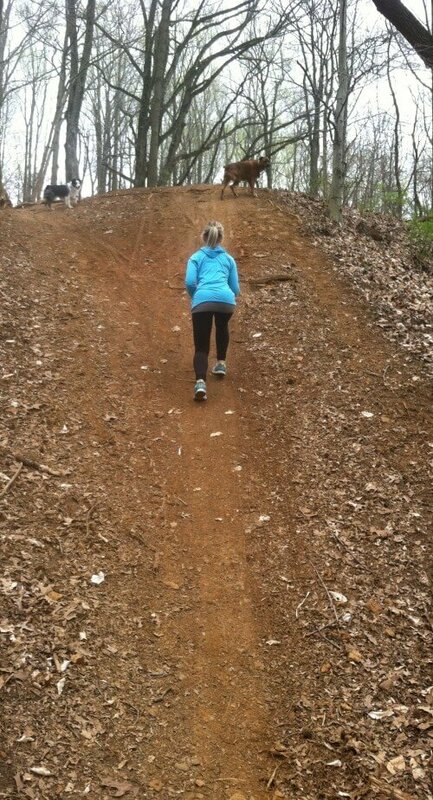 However, as much as I hate to run, I adore hiking and trail running. I don’t know if it’s being in the beautiful woods or if it’s the challenging terrain, but I mostly think it’s because I’ve always been a nature/outdoors-y girl and trail running is a way I can spend some time enjoying God’s beautiful artistry. If you haven’t taken advantage of your local state park trails, I encourage you to give them a try. Not only are you getting a good workout, but there are so many health benefits to being outside. Numerous studies show that exercising outdoors actually increases the gains of your workout compared to exercising indoors! Another bit of research I found very interesting was that being in nature most powerfully nurtures us when we are at the most “at risk” of disease, depression or desperation. So cool! Now back to today’s workout: I get bored doing the same things twice, so I’m always looking for new ways to get a great workout out on the trail. My favorite thing to do out on the trails are to run or briskly walk for a few minutes (about 5 minutes) until I find a log or big rock. Once I get to a good log or rock, I’ll stop and do some body weight exercises. Then I keep running or walking for another 5 or so minutes until I find another good rock or log. I keep alternating from running or walking and doing an exercise. Also, whenever I get to a hill, I sprint up it, as fast as I can. I jog back down and repeat a few times. This gets the heart pumping and the legs burning. It’s an amazing workout! 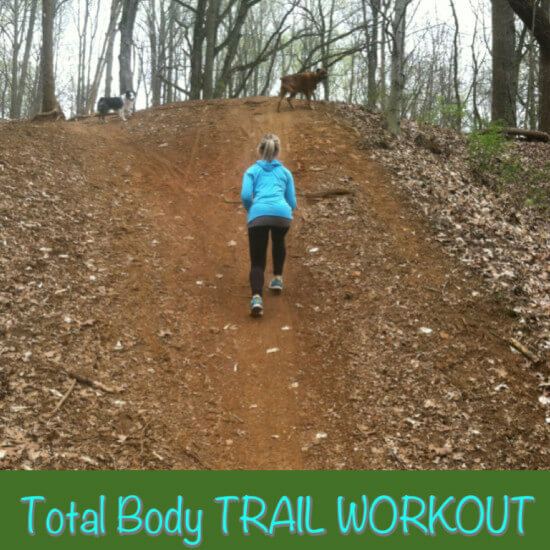 Follow along with me on my favorite trail exercises. 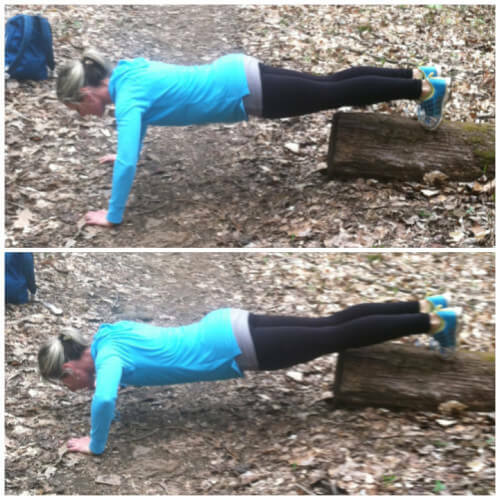 If you can incorporate these throughout your next hike, you’ll get a full total body workout! This is a great way to burn a lot of extra calories, shed more fat and get those muscles burning! Whenever you see a good hill, sprint up it as fast as you can. Walk back down and sprint back up for a total of 10 hill sprints. Take as much rest as necessary between sprints. This is a real leg burner and heart pounder! The key to sprinting up a steep hill is to get down low, shorten your stride, and keep looking straight ahead or up to the top. Find a log or rock. Stand facing it. Touch the ball of your right foot to the top of the log. Quickly switch feet so that the left ball of your foot is on top of the log. Keep switching back and forth as quickly as you can. Do 1 full minute of toe taps. Find a log or rock. Place the ball of one foot on the log or rock. Step your other foot out a few feet in front of you. Brace your core and lower your body as far as you can go. Pause and then push yourself back up to starting position. Complete 20 lunges on each side. Place the balls of your feet on a rock or log. Get into pushup position. Your body should form a straight line from your feet to your head. Lower your body until your chest nearly touches the ground. Go up to starting position. Complete 20 pushups. Take as much rest as necessary to complete all the pushups. Find a sturdy log. Stand facing the log. Step up on the log with your left foot. As your left foot is steady on the log, raise your right leg behind you. Step down with your right foot. Repeat with the same leg 20 times. Repeat on the other side. Find a log and stand with your feet in between the log. Place your right foot on top of the log. Jump up and switch feet as quickly as you can. Repeat for 1 full minute. You don’t have to have a puddle for this one, but if you do – even better! Explosively jump as far and as high as you can across the trail. 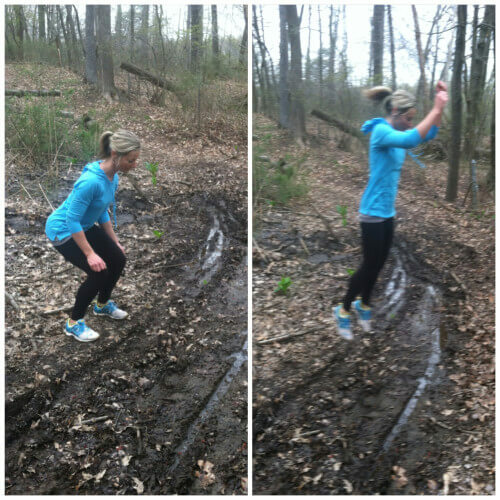 Do 15 puddle or trail jumps. 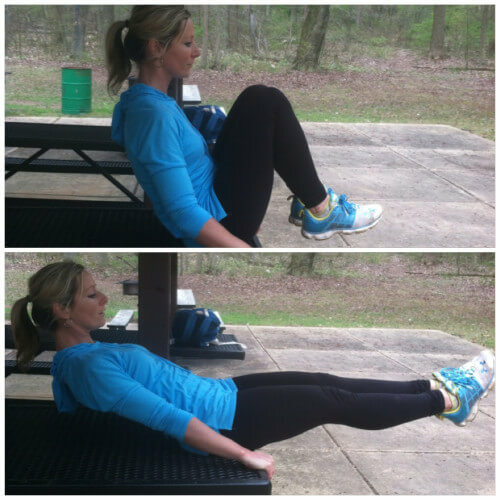 Start by sitting on the edge of a picnic table with your knees up to your chest. Stretch your legs out as you lean back to a 45 degree angle. Repeat. Complete 30 reps. If you can find a grill like this (or a downed tree), these rows are such a great strength builder for the back and biceps. Grab the handles and pull your chest to your hands. Repeat 20 times. I agree ~ I love this 🙂 and can’t wait to hit the trials!!! we are very lucky to have such a great outdoor rec area – lots and lots of hills and a huge lagoon to run around. we also have 3 “death hills” that will always be a challenge to all who attempt these. i hit the hills and hike 4-6x a week. with so many trails and challenge variations – i never get bored and ALWAYS a challenge. Sounds so awesome! I’m jealous! Thanks for the great workout! I worked up a sweat hiking yesterday with my fast pace, but it didn’t occur to me to do a whole body workout. My daughter and I can do these with her two children in tow. Excellent post, and I love all the pics! There really is nothing like taking to the trails to clear your mind and push your body. So beautiful, especially in the early morning. Thanks for sharing! I just found your site and am very thankful. I really appreciate the fitness and training posts as your idea of exercise matches mine. 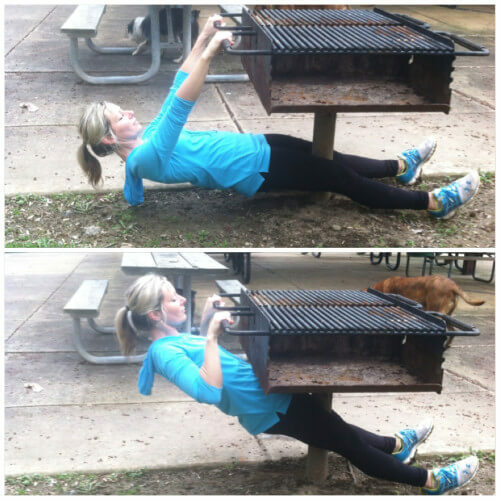 What a great idea to include the BBQ grill to do rows! I use a similar technique with my pull-up/dip stand. Since becoming a mom, I let the strength aspect of fitness fall by the wayside. For someone who used to be able to do numerous pull-ups to realize she can’t pull herself up at all, I knew it was time to take action! I lay my stand on the ground and place a metal bar across it in order to do rows or prone pull-ups. 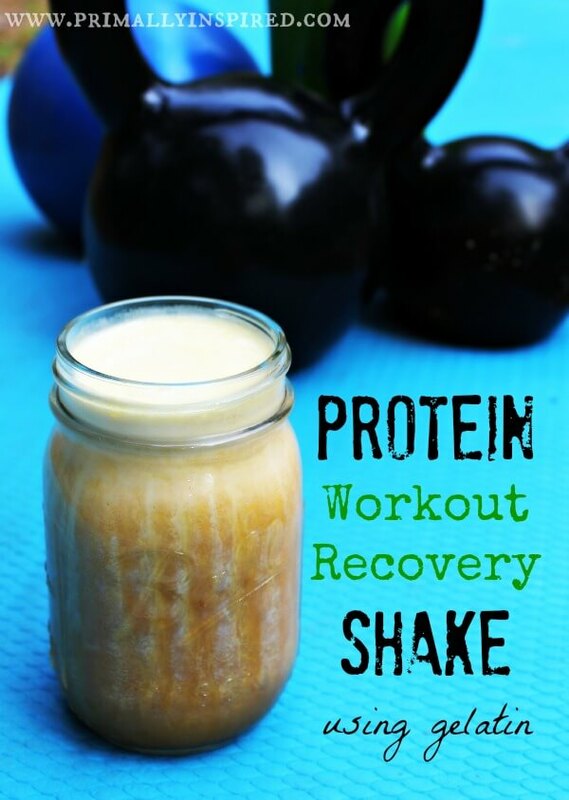 I know it is working because I am making strength gains each week. I am confident I will be able to do a pull-up again! I have recently started including sprints into my week and hope that will improve my fat loss. I have struggled with emotional eating and have been trying to find better solutions that don’t involve food. I have, at least, removed most grains (except non-GMO corn) and all processed junk from my diet. With the help of sites such as yours, I know I can continue on this healthy path and improve the quality of life for my family. What is the best way to plan a week of workouts using whole body routines? 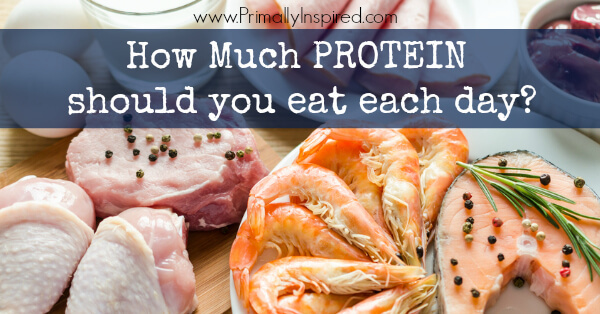 I feel like three times per week is ideal but does that give the muscles enough recovery time? Is straight cardio performed on the non-strength days? What about rest days? 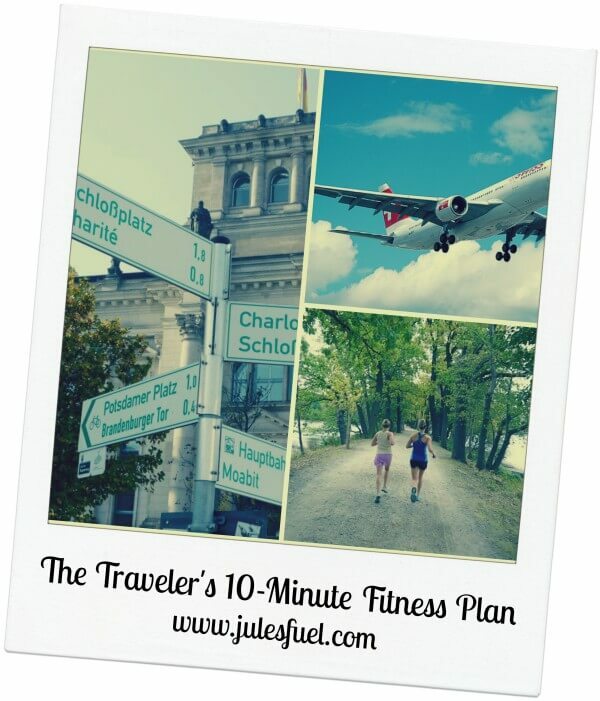 I am excited to try one of your workouts today for the first time!